On last night's Legally Blonde the Musical -- The Search for Elle Woods, the final four competitors got a little cheerleading training. In this photo from August 2006, Laura Bell Bundy took a tumble into the world of cheerleading with Robert Eskridge at Town & Village School of Dance in Paris, Ky., in preparation for originating the role of Elle Woods on Broadway. Copyrighted Herald-Leader photo by Matt Goins. At the end of last night's audition on Legally Blonde The Musical -- The Search for a more reasonable title, judge and writer Heather Hach said, "I completely want to do a Frankenstein and combine the comedy of Rhiannon, Bailey’s professionalism and star quality, the freshness of Lauren and Autumn’s voice." Well, that sort of takes us back to our original misgiving about this reality TV as Broadway audition thing: They've ended up with a field where no one is a complete picture of Elle Woods, so there's going to be some settling to do to fill this role. Yes, this blog is a bit of Autumn rooting section, but she is not the dancer Bailey is, doesn't have the charisma of Rhiannon and lacks Lauren's youthfulness. Ultimately, the judges decided Lauren was a bit too youthful and sent her on home before the show ended. The other shoe will drop next week when another finalist is sent packing at the beginning of the episode before the last audition. The final show down will be in the Palace Theatre in front of director Jerry Mitchell, who has the last call. It's hard to imagine Rhiannon will make it, because she wound up very winded in the audition with What You Want last night, and her vocals were a horror show. That would create a Bailey-Autumn finale and they're not two really friendly competitors. Bailey was relishing Autumn's tribulations with tap dancing last night, and Autumn doesn't believe any of the final four have earned their shot at Broadway the way she has. I'm going to stick with my Autumn prediction, maybe not quite as confidently as last week. A key to me was when Bernie Telsey talked to Autumn about her dancing and said, "when it’s in your body, you're Elle, 100 percent." Autumn's been straight up about not being a great auditioner. But it is much easier to believe that she can get that character in her body in the few weeks between the end of the competition and her first performance, which is actually next Wednesday, than it is to believe Bailey could develop the depth or Rhiannon could develop the vocal chops and to play Elle. All that said, I can't help thinking Autumn may be a better Elphaba or Millie. And you know, the Southern pride side of us may like to see the role already played by Louisianan Reese Witherspoon and Kentuckian Laura Bell Bundy go to South Carolinian Bailey. We'll see, next week. Laura Bell Bundy has signed on to stay with Legally Blonde -- the Musical, through the Spring. After that, she will likely be moving on from her first leading role on Broadway, as SoCal sorority girl turned Harvard Law standout Elle Woods. Last month, Laura (photo, left, by Aaron Lee Fineman) told us she's looking to pursue other projects, including her burgeoning career as a recording artist. MTV, it appears, will be looking for her replacement. Last fall, the network showed Legally Blonde in its entirety several times, including a sing-along version, an unprecedented move for a Broadway musical that was still running. Now, according to Playbill, MTV is planning a reality series to find an actress to take over the part. The New York Post reports there's a casting call for the show in Orlando on Jan. 21. They are looking for non-union actresses 18 and over, according to the paper. This looks similar to Grease: You're the One That I Want, last year's NBC series that found Max Crumm and Laura Osnes to play Danny and Sandy in the current revival of Grease on Broadway. University of Kentucky graduate Derek Keeling was in the running for Danny up until the next-to-the-last episode. For Legally Blonde, this looks like a dicey proposition. Yes, it'll get the show more national publicity. But Elle Woods is a huge, huge part. The stars are going to have to line up just right for the reality show to find an untested actress with the triple-threat talents and stamina to do that part for eight shows a week. So far, the information is simply there will be a reality show, so no word on whether this will be decided by viewers, judges, a combination of the two and if Laura will play any role in the TV show. Laura Bell Bundy on stage Dec. 10 at the Lexington Opera House for a holiday concert with lifelong friend Lyndy Franklin. Copyrighted photo by Angela Baldridge for the Herald-Leader/Kentucky.com. The last time we had a good chat with Laura Bell Bundy, it was the eve of the opening of Legally Blonde -- the Musical, the Broadway hit that has made the Lexington-native a certified stage star. A lot has happened since that late April night: Bundy received a Tony Award nomination for best actress in a musical, the show was filmed and aired nationwide by MTV, and Broadway endured a 20-day shutdown with the stage hands strike. All that, and she also released her solo debut as a country artist, Longing for a Place Already Gone, and played gigs around New York to promote it. So, we decided to take advantage of Bundy being in town for her holiday concert with fellow Broadway performer, Lexington-native and lifelong friend Lyndy Franklin to chat with her about how it’s been going and her future with and beyond Blonde. Copious Notes: Tell us about the strike. Laura Bell Bundy: There were rumors like, ‘OK, tonight, you might need to take your stuff out of the theater,’ months before we struck. Then, all of a sudden, within 48 hours it was like, ‘Take your stuff out of the theater, if you need anything. Make sure you take it home tonight.’ We weren’t able to get into the theater, even to get our costumes for the Thanksgiving parade [Macy’s Thanksgiving Day Parade] because the Local One stage crew opens the door to the theater. But we were required by Equity (the stage actors union) to show up at what would be our half hour (call) and stay until the time of the show in case there was a deal. We had to do that for the first week. The second week, they started to say, ‘Well, you don’t have to come tonight because we know they’re not negotiating.’ So then we started to come every couple of shows. CN: So, what was it like being closed during that period of time, during the holiday season, when you’re one of the hottest tickets on Broadway? LBB: It was really unfortunate, because I’m sure we would have had incredible audiences during those weeks. Our show was pretty much sold out for that week and it’s a big money-maker week that lasts them a long time. You have two major weeks a year: Thanksgiving week and the week following Christmas. But in a lot of ways, it was OK for me, because my family was up in New York, and I got to spend a lot more time with them. Laura Bell Bundy and Lyndy Franklin perform at the Lexington Opera House Dec. 10, 2007. Copyrighted Herald-Leader/Kentucky.com photo by Angela Baldridge. Most nights Laura Bell Bundy and Lyndy Franklin perform under the lights of Broadway. But last night, just like they did decades ago, the Lexington natives and lifelong friends were putting on a show in Kentucky. "The last time we put on a holiday show, it was 20 years ago at the Bourbon Heights Nursing Home in Paris," Bundy told the audience that packed the Lexington Opera House. "I think we've come a long way since then." Bundy stars in the Broadway hit, Legally Blonde -- The Musical, and Franklin is the dance captain and understudies several roles in the acclaimed revival of A Chorus Line. The concert was a mix of holiday classics and Broadway tunes, all backed by the Bluegrass Area Jazz Ambassadors. Together and solo, they reminded local audiences of their flairs for song and dance, and they laughed through a few mishaps. Straight from Broadway, Lexington's Laura Bell Bundy and Lyndy Franklin will be on stage tonight at the Lexington Opera House for a show of Christmas and Broadway favorites. Fresh from her flight from NYC back to the Bluegrass, we got a few minutes to chat with Laura Bell, who gave a little preview of tonight's event, which will include Laura and Lyndy singing songs from the Broadway hits they are currently in, Legally Blonde and A Chorus Line, respectively. "If Lyndy was not involved, I don't know that I'd be doing this," Laura said. "Doing the show together was our motivation to get together." Lyndy (photo, right, by Aaron Lee Fineman), Laura said, was largely the driving force behind arranging things for the concert such as rehearsals, scripts and whatnot. Lyndy is the dance captain for A Chorus Line and an understudy for numerous speaking and non-speaking roles in the show. Laura, of course, is the Tony Award-nominated star of Legally Blonde -- The Musical. Audiences at the Opera House will hear Laura sing So Much Better, Blonde's first act finale, and Lyndy will sing the Chorus Line classic, What I Did for Love. They'll also duet on For Good from Wicked, in which Laura played the part of Glinda on Broadway as the frequent replacement for Kristin Chenoweth. They'll also share the stage and solo on a number of Christmas hits, accompanied by the Bluegrass Area Jazz Ambassadors (BAJA). Last year, BAJA recorded a Christmas album with Laura, and together, they presented a holiday concert at the University of Kentucky's Memorial Hall. Laura says the wheels were put in motion for this year's concert after that event. "We wanted to do it with more preparation, on a bigger scale and announced more in advance," Laura said. The concert is a benefit for Laura's educational charity, Kreative Kids, the Opera House Fund Capital Campaign and BAJA. ~ We also talked to Laura about Blonde; the high of presenting the show on MTV, the low of the stagehand's strike and her future with the show. Check back later this week for a post from that conversation. Elle Woods (Laura Bell Bundy) submits her "personal essay" for admission to Harvard Law School in the Broadway production of Legally Blonde, which is showing on MTV this weekend. Below, Christian Borle as Emmett, Elle and Richard H. Blake as Warner. Copyrighted photos courtesy of Barlow Hartman. At 1 p.m. Saturday, the Copley household, like a lot of other Central Kentuckians, I'm sure, couldn't be in front of the TV. But after getting the birthday parties, soccer games, at THAT INCREDIBLE UK FOOTBALL GAME out of the way, MTV's airing of Legally Blonde was our primetime viewing. That came thanks to the miracle of TiVo, and I seriously mean "thanks" because, with kids watching, it let us skip the ads for some of MTV's racier shows and some of the inane commentary by the cast of The Hills, a show I am too old to be familiar with -- I'm from that cranky generation that likes to reminisce about the good ol' days when MTV showed music. 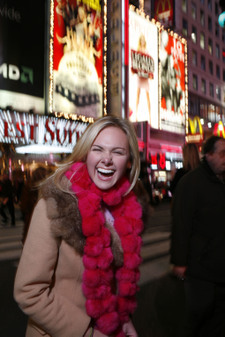 Laura Bell Bundy will be on MTV's TRL from 3:30 to 4:30 p.m. today. The Lexington native will be promoting the showing of Legally Blonde: The Musical, which she stars in, at 1 p.m. Saturday and 7 p.m. Sunday on MTV. If you were hoping to tune in Lexington-native Laura Bell Bundy in Legally Blonde today, the MTV showing of the hit Broadway musical has been pushed back two weeks. It will air at 1 p.m. Oct. 13. Click here to read details of the filming of the show from Playbill. In the meantime, check out this Nightline interview of Laura Bell regarding her new y'alternative album. The day after one blonde bombed on MTV, the network announced that it will be showing a certified Blonde hit at the end of this month. Last week, we mentioned that the one-time-music channel was negotiating with the producers of the Legally Blonde the Musical to air a performance of the show in its entirety. Monday, it became official: Broadway's Legally Blonde, starring Lexington native Laura Bell Bundy, will air at 1 p.m. Sept. 29 (that's a Saturday) and there will be up to six subsequent airings. By the way, in regard to Britney Spears' train-wreck performance on the MTV Video Music Awards Sunday, the AP had a thought-provoking column on whether it was fair to criticize her out of shape physique. The New York Post and Playbill are reporting that the producers of Legally Blonde the Musical are in negotiations with MTV to show a performance of the Broadway hit starring Lexington native Laura Bell Bundy. The show would be taped in September and air sometime in October. The broadcast would be an unprecedented move for a Broadway musical that is still running. While shows are frequently taped to be shown after closing, and Les Miserables was aired in a concert version during its run, Broadway producers have generally felt that putting a show on TV will hurt the box office. But, as Michael Riedel's Post column notes, the counter-intuitive view is that Blonde TV will just make viewers in its target audience of females 15-25 want to see the live show more. Check out this New York Times story about Laura Bell Bundy's country act that was recently unveiled at New York's Birdland jazz club. The story is about Broadway stars in general carving out side careers as recording artists. But the lead and a lot of the text is devoted to Laura Bell, no Bundy, and her rootsy country act she calls, "y'alternative." She makes the point in the story that she is marketing her recording artist self as Laura Bell to create a second identity. But the Hairspray and Legally Blonde star also says she thinks this persona is closer to her true self than anything else she's done, and that it springs in large part from her Lexington roots. ~ In related news, there's this amusing and informative Michael Riedel column about Disney's floundering stage version of The Little Mermaid. 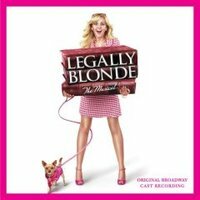 ~ The original cast recording from Legally Blonde is out. Finally, a chance to revisit a few of the show's infectious tunes such as Omigod You Guys, So Much Better and Bend and Snap that have not truly left my brain since opening night. It's not the next great American musical, but the show is a lot of fun, and the music is a big part of that. In addition to Laura's new solo CD, Longing for a Place Already Gone, the Blonde recording should give you a good sense of her vocal chops. You'll also hear standout performances from Laura's castmates, such as Leslie Kritzer and Christian Borle. ~ Surf School -- Laura Bell filmed this teen-surf comedy before getting to work on Blonde, and it only played in a few theaters across the country. The DVD is out today. It's the story of a group of high school misfits who enroll in a surf academy run by an aging hippie played by Harland Williams, in an effort to win a big surfing competition. Laura plays a death chick who comes out of her shell at on the beach. I haven't watched it yet, but I do have to give the writers credit for not trying to sell us Laura as an outcast without some heavy costuming. In early scenes, she's gothed up with long, eye-shading black hair and dark makeup. Teen movies tend to stretch credibility when they try to cast attractive actresses like Hillary Duff or Lindsay Lohan as outcasts. Like they couldn't get a date in high school. Sure. Fair warning, this is billed as an "Unrated" version, so it probably wouldn't be right for your preteen Blonde or Hairspray groupie. “Yeah, it’s funny because the first time I went to go see the original musical was with one of my best friends at the time, Laura Bell Bundy, she was the original Amber on Broadway,” said Snow. “She originated the musical role. She was kind of my big sister growing up. She took me to see the Broadway show a couple of times. And then when I got the call for this audition, I called her and I was like, ‘How weird is that?’ And then when I got the part she was so excited. It was kind of like passing the torch to her little sister to play basically her. So I had seen it a bunch of times and went backstage and met Marissa [Jaret Winokur] and everybody. I was so excited to even meet anybody, let alone I didn’t know I was going to be a part of it five years later." I have a feeling Brittany maybe meant to say Laura gave her tickets to see the show, or something like that. But clearly, the actors who met on Guiding Light have a good friendship. The Hairspray movie opens Friday. ~ Laura has a new website now, lauraashleybellbundy.com. The Legally Blonde cast, led by Laura Bell Bundy, will be on the Today show at the bottom of the 8 and 9 a.m. hours this morning, according to Playbill.com. Two numbers are set for the show: What You Want, Elle Wood's "personal essay" to get into Harvard, and Bend and Snap, led by Leslie Kritzer, who will be a lead in a Broadway show sooner than later. Blonde was originally scheduled for the Today show April 27, but the performance was canceled due to rain. You won't see Rosie, but you will see Laura Bell Bundy on The View tomorrow morning (May 31). She and the Legally Blonde cast will be performing a number from the show. It's at 11 a.m. on WTVQ here in Lexington. According to Variety, Legally Blonde came close to landing a performance spot in the Tony Awards broadcast, despite not being nominated for best musical. The rule has been only nominees for best musical and revival of a musical get to perform on the broadcast. But a move was afoot to get performances from Blonde and LoveMusik, which also was not nominated for best musical, on the show to liven things up. But that idea appears to have been nixed as a Broadway contingent contended that the TV showcase, which often means a box office boost, is part of the reward for being nominated and it should not be arbitrarily handed out. The New York Post's Michael Riedel, of course, has a more colorful and detailed account of the dust-up. The Tony Awards site has posted a nice video of interviews with this year's Tony nominees, including Laura Bell Bundy, Christian Borle and Jerry Mitchell. Laura Bell Bundy met the press at the opening night party for Legally Blonde on April 29, 2007 (photo by Aaron Lee Fineman). 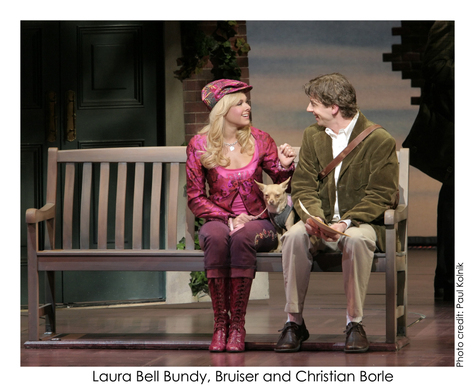 ~ Click here to listen to Laura Bell Bundy talk about getting her Tony nomination. ~ Check out our new Laura Bell Bundy photo album. Laura Bell Bundy realized her resume had changed forever when friends started text messaging her with the phrase, "Tony-nominated actress Laura Bell Bundy." "How crazy is that," she exclaimed, making her way down Broadway Tuesday afternoon. In April, Laura Bell Bundy realized her dream of originating a leading role in a Broadway musical, playing Elle Woods in the musical version of Legally Blonde. Tuesday morning, she came one step closer to her dream of winning a Tony Award, though she acknowledges what everyone else seems to believe: When the prizes are handed out June 10, Christine Ebersole will walk off with the hardware for best leading actress in a musical for Grey Gardens. But to even get the nomination, Bundy had some stiff competition from experienced and previously honored women. The other nominees for leading actress in a musical are Ebersole, Donna Murphy for LoveMusik, Audra McDonald for 110 in the Shade, and Debra Monk for Curtains. "The company I'm in is amazing," Bundy said this afternoon. "Every single woman has already won a Tony Award, that I'm in this category with." And several lauded actors were left out of the running, including Kristin Chenoweth, who was eligible for The Apple Tree. Before Blonde opened, Bundy said she knew this was a very competitive year for women, which prompted her to try to put the Tony nominations out of her mind. "I had sort of let it go," Bundy, 26, said. "I had said, if it's meant to be, it will happen. My time will come eventually. I'm going to be in this business a long time, doing theater a long time. It would be nice, but every show is starring a woman this year, and not just any old woman -- very talented women. "I had tried to emotionally detach from it . . . but please, it's always nice, right? Let's be honest. It's like a dream come true." Hearing her name annouced promted Bundy run around her apartement squealing like a 10-year-old girl, she says. Then came phone calls from Tony-winning friends such as Hairspray star Marissa Jaret Winokur saying, "welcome to the club." To top it all off, today is Bundy's mother's birthday. In an e-mail titled, "I am the happiest mom in the world right now," Lorna Bundy-Jones wrote, "I am 53 years old today and what a birthday present." "That's my lucky number," Bundy said of her mom's age. "I got her a pink nano iPod," which will of course contain the Legally Blonde cast recording once it's completed. Bundy's joy will have to tempered a bit by the snub of Legally Blonde in the best musical category. "It is a big bummer to me that the show did not get nominated and that Jerry Mitchell didn't get it for director, because his work is amazing," Bundy said. That means that the show will not have a showcase during the awards telecast on CBS. Best musical nominees perform a number during the Tony telecast. The best musical nominees are Curtains, Grey Gardens, Mary Poppins and Spring Awakening. Blonde, which received seven nominations, has the strange distinction of being shut out of the top category, while it was nominated for best original score of a musical (Laurence O'Keefe and Nell Benjamin) and best book of a musical (Heather Hach). Mary Poppins, which seems to be a bit of a surprise best musical nominee, was the odd show out of the score and book categories. Blonde's other nominations include best featured actor in a musical (Christian Borle), best featured actress (Orfeh), best choreography (Jerry Mitchell), and best costume design (Gregg Barnes). Spring Awakening was the leading nominee in the musical category, with 11 nominations. Tom Stoppard's The Coast of Utopia was the leading nominee among plays with 10. For a complete list of nominees, click here. Like Miss Hannigan in Annie, some Broadway theater writers seem to have minimal patience for little girls. A number of the reviews of Legally Blonde, the new Broadway musical starring Lexington native Laura Bell Bundy, drove that point home, baking the show in a pie with other musicals that appeal to the same audience of 'tween and teen girls and then wincing at the taste. The sentiment seems to be that with fare such as Wicked (photo, above), Hairspray and now Blonde, not to mention the Disneyfication of Broadway with The Lion King, Mary Poppins, et al., Broadway is catering too much to an audience that has to beg its parents for the $110 tickets. Young people want to go to the theater! Even if you’ve paid scant attention to the performing arts in the past decade, you know there is a lot of hand-wringing about the graying of the audience. Young people are more attracted to movies, television and computers, leaving arts administrators wondering whether there will be an audience in the next generation. So it’s kind of funny that when live theater that attracts a young audience comes along, some people feel a need to criticize it for doing just that. The fear seems to be the dumbing-down of theater, a somewhat understandable point of view from the men who dominate the critical crowd in New York. But if you are an adult, there doesn’t seem to be a shortage of theater aimed toward you and your peers on and off Broadway. Right now you have got LoveMusik, the musical about Kurt Weill and Lotte Lenya, which I doubt will be overrun with bubblegum snappers; Frost/Nixon, which isn’t about any boy band; Radio Golf, the August Wilson swan song that sounds so “dad”; and Grey Gardens, which even a lot of adults find impenetrable. Granted, I don’t live in New York, but if I went looking for mature theater on a trip, I could load my calendar. Some might say, well, you’re attracting the kids with dumb shows. Well, let’s first consider the idea of starter shows. If you sat a preteen or early teen in front of a lot of the shows I mentioned two paragraphs ago, you’d have to keep elbowing them awake. It’s the same as if you tried to cultivate a movie fan by first taking him or her to a Bergman festival. One in 100 might be hooked, but I dare say most of us probably start with something a bit fluffier, a bit more generally accessible, and work our ways into appreciations of more complex and intellectual fare. And then, its a bit condescending to call all of these productions fluff. Hairspray addresses serious issues of race and image. Blonde asserts that women need more than a beautiful body to succeed. And Wicked, in particular, works on multiple levels. After seeing it in Cincinnati, my 10-year-old daughter declared Wicked “the best show ever!” I’m sure that right now, her sentiment is mostly based on the fanciful story. But as she sees it over the years, she’ll likely discover the different levels of social and political commentary in the tale of the Witches of Oz. 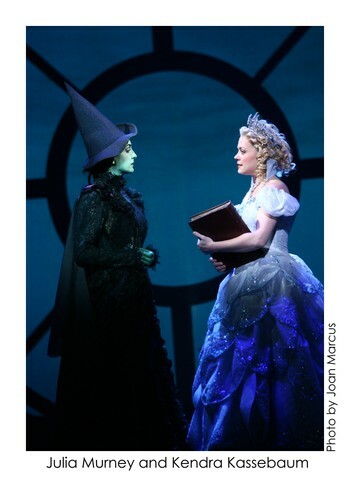 And thanks to shows like Wicked, it isn’t hard to lure her to the theater now. She might not always know what she’s getting, but she’s up for trying it. Like it or not, thanks in part to shows like Legally Blonde, a new theater audience is growing. After the Friday, April 27, performance of Legally Blonde, Laura Bell Bundy signed autographs and posed for photos with students from Woodford County High School. The photo is courtesy of Tanya Bell, Laura's aunt. 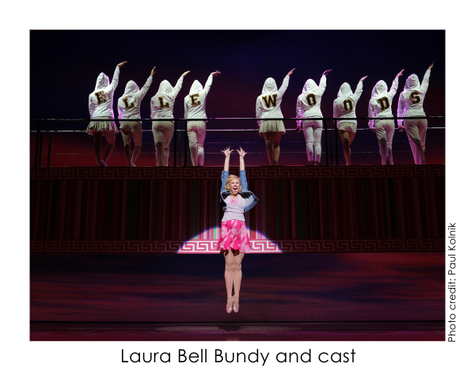 After a dizzying opening weekend and flurry of Legally Blonde posts, we wanted to give the Laura Bell Bundy coverage a little rest for a week. But we are going to keep you updated here at Copious Notes on new things happening with the show and Lexington's Broadway star. ~ The latest episode of Broadway World's Broadway Beat has a great feature on Blonde with footage from the show, interviews with the cast and others at the opening night party, and -- this is the real prize -- interview and show footage of 10-year-old Laura when she was starring Off Broadway in Ruthless. ~ Broadway.com has Word of Mouth, a feature in which three "regular theater goers" review the show. In addition to their comments, there is also footage of the show with this one. ~ According to Playbill, the cast of Legally Blonde may well be in the studio as we write laying down tracks for the show's cast recording. Cast recordings are by no means a given these days, so it is very cool for the Blonde cast that they will get to make one. The recording is expected to be in stores July 17. ~ Variety reports that despite mixed reviews, Blonde was playing 97 percent full houses, and ticket sales were up $150,000 last week, bucking a downward trend in Broadway box office. ~ We're just a week away from the Tony Award nominations, where most prognosticators seem to think Laura will get a nod for best actress in a musical. Benita Heath wrote a really nice profile of Ashland actor Steve Kazee in Sunday's Arts+Life in the Herald-Leader and Kentucky.com. The Broadway revival of 110 in the Shade, in which Kazee plays Starbuck, was hit by tragedy last week when star Audra McDonald's father died in a gyroplane accident near Fresno, Calif. The Fresno Bee published a beautiful piece on Stanley McDonald Jr., a retired school administrator. The Roundabout Theatre revival of 110 missed performances on Wednesday and Thursday, so Audra McDonald could be with her family. The production resumed Friday and will open on schedule, Wednesday. We will compile reviews here Thursday. Blonde Highlights: The Reviews P.S. "It's a little nerve wracking, but I've come to this place where it's like if I'm connected on stage and I'm doing my job -- I'm really in the moment -- I don't give a crap what they say about me. I'm doing the best that I can do, and if they can't see what's going on there, I have no control over what they think and what they do, and what they say and what they write, and I don't think wasting my time worrying about it is useful." TOTALLY NEW: The Philly Inquirer's Howard Shapiro liked Laura and called the show, "a great big blonde joke that pays off over and over." NEW: Here is Kurt Loder's take for VH1. I didn't know Kurt Loder reviewed Broadway, but I bet Laura is glad he does. NEW: The St. Louis Post-Dispatch's Judith Newmark seems to think the show was a good move for hometown company Fox Theatricals. NEW: Fox News chimes in with affirmation. NEW: Reuters credits Blonde with being better than most film-to-stage shows. Variety is one of the more influential notices, and David Rooney was wild about the show and Laura. The New York Sun's Eric Grode is cautiously enthusiastic. The Cleveland Plain Dealer's Tony Brown puts his enthusiasm in words we can understand, and even rates Bundy over Witherspoon. Michael Sommers of the New Jersey Star-Ledger likes the show, but not Laura. Theatremania.com's David Finkle calls it a hit. The New York Times' Ben Brantley is not a big fan of movies turned into musicals, and though he says this one is better than most, clearly, he wasn't nuts about it. I would like to know who these girls are that supposedly hated Elphaba getting the guy in Wicked, because all the ones I know who saw it loved that aspect of the story. Bloomberg's John Simon seems to be trying hard to find something to like, and quite honestly, I can't tell what he thought of Laura. The AP's Michael Kuchwara sounds disappointed. The bad news for the Blonde camp is that his review gets picked up by most papers across the country. Newsday's Linda Winer doesn't seem to be a fan. That a.m. New York's review is headlined "Legally Bland" tells you a lot. It does have the meanest comment I've read about Laura. Well, that seems to be enough reading for now, and I have to remind myself that part of the reason I came back to my room was to go to bed. Anytime I compile groups of reviews like this, I am reminded of my constant assertion that reviews are one person's opinion. That should be and usually is a well informed opinion, but it's still an opinion, colored by the critic's taste and experiences. It's always amusing to see how two critics will bring up the same things but have completely different takes, like here. I was contemplating after seeing Legally Blonde Friday night whether it was "critic proof," meaning, is there enough general appeal there to keep the show going even with some negative press. I dunno. Time will tell. But, two of the punching bags several of the scribes pulled out for the Blonde reviews -- Hairspray and Wicked -- are still running very strong. Time will tell us how Blonde holds up. By the way, in addition to this blog stuff, we ran two stories in the Gutenberg edition. Sunday, we previewed the big night and today, we have the big story on the opening. The opening night vibe was solidified when photographers and camera crews rushed down the aisle for the curtain call, and Jerry Mitchell and producers, etc. swung onto to stage. All of the women received bouquets of pink roses, and you could see a rollercoaster of emotion on Laura's face: ready to cry one second, ready to party the next. Going out, I witnessed the surreal scene of Joan Rivers congratulating Laura's family and telling her mom, Lorna Bundy Jones, that she should be very proud. The cast, crew and audience repaired to Cirpiani, a cavernous restaurant across the street from Grand Central Station, to party for a few hours. That affair was trolled by numerous photographers and camera crews. Both Xtra and Entertainment Tonight were there, and apparently Rosie O'Donnell will be talking about the show on The View today, so if you're interested in seeing how it went, tune them in. And I thought people cheered on Friday night. The overture was met with a roar, and some of the applause even seemed to throw Bruiser off just a tad. Of course, every actor got an ovation from his or (mostly) her pocket of supporters, but Laura Bell's was a roar that delayed her first few notes. You have to note that this is an audience of investors, creative folks and families -- as well as Rosie O'Donnell and Kathie Lee Gifford, but the energy is amazing. Producer and L&O:SVU actor Tamara Tunie had the most interesting pre-show comment, saying she wants to see a return to the era when musicals are written for stars . . . like Laura Bell. Time for Act II, and oh, Caroline, Corbin said, "Hi." Blonde Highlights: Should I Call my Kid? Corbin Bleu is coming. Should I call my daughter to make her jealous? I just strolled by the Palace Theatre, which is definitely getting geared up for the big event. Barricades are up routing a thin stream of foot traffic past the theater and spotlights and one of those TV backdrops are up for the arrivals. It looks like time to start getting ready. When I cover a story, I look for ways to understand and identify with the people I'm covering. One way to identify with Don Bundy, Laura Bell Bundy' dad, came this morning when my phone rang, shortly after 11. Crackling through the receiver was the voice of my little girl singing a solo in the church musical. Certainly the setting, scale and purpose of that presentation are far different from a Broadway musical. But the pride has to be much the same, especially hearing the work and progress she made. It's the same pride I have, say, watching my boy do math that makes my head spin or hearing he made dinner for his mommy and sister last night. All of us who are parents love to see our kids grow, achieve and test waters. So, when I talk to Don or Laura's mom, grandparents and step parents after tonight's performance, I'll have an inkling of the pride they feel. Of course, it stinks not being there for the big moment, and that experience made me appreciate all the more how blessed any parent is to be there for their kids' big moments. Certainly, there are many dads and moms who have to miss big moment after big moment, like soldiers serving overseas, and the other parent calling and holding up the phone so at least the absentee parent can hear is not an option. After Saturday's Blonde matinee, Laura did her talk-back session with students from Tates Creek High School on their senior trip. There were a bunch of interesting questions like whether she prefers film or theater. Answer, she likes theater for the instant response. Then, one brave guy asked Laura, "We don't know each other, but will you go to prom with me?" Richard H. Blake, who plays Warner and was also part of the session, stepped forward and said, "sure." After a good chuckle from that, Laura smiled and said, "I would, but I have a show." Post Script: Talking to Laura's family later in the day, they said she actually received a similar proposal from a fan when she was on The Guiding Light, and she said yes. I was hustling over to the Palace from Studio 54 and missed this part: One of the first questions from the Tates Creek kids was what high school she went to, and when she said Lexington Catholic, she was roundly booed. Guess that hometown hero stuff only earns you so much slack. Overall, it sounded like a fun, good-spirited exchange. By the way, trying to make your way down the sidewalks of Broadway on Saturday afternoon helps you understand what a Derby horse stuck in traffic must feel like. Wayne Bell, Laura Bell Bundy's grandfather, is having breakfast at the Evergreen restaurant, a little diner on 47th Street, when yet another round of Bell and Bundy family friends walk through the door. After a rousing round of greetings, folks at the neighboring table apparently inquire what has everyone in the city. Like any proud grandparent, Wayne is only too happy to regale them with the tale of his granddaughter who is starring in Legally Blonde. The crew of family and friends who have piled into town for opening weekend gets right down to the Bundy's next door neighbors when Laura was born. Today, we are off to see two other Kentucky-connected shows: 110 in the Shade, which stars Ashland's Steve Kazee opposite Audra McDonald at Studio 54 and Gulf View Drive, the third chapter of Arlene Hutton's Nibroc Trilogy. We'll also be catching up with the Tates Creek High School senior trip, which will get a little time with Laura after this afternoon's matinee. The first story I wrote about Laura Bell Bundy was when she was when she played Dainty June in Gypsy at the Papermill Playhouse in Milburn, N.J. The second was when she played Lola in Lexington Catholic High School's production of Damn Yankees for her senior play in 1999. Way back then, we knew that the big dream for Laura was to star in a Broadway show, so it was quite surreal to see her rise through the Palace Theatre floor Friday night to applause that couldn't have been stronger if the theater was filled with Kentuckians -- there was a strong contingent from Woodford County High School that Laura met with after the show. Then she proceeded to charge through a two-and-a-half hour dance marathon that made it obvious this show, Legally Blonde, was the creation of a gifted choreographer, Jerry Mitchell. One of the big deals about this weekend is that Legally Blonde gets officially reviewed by New York and national theater scribes, and Laura's performance will most certainly be closely dissected. So far, so good. The reviews from the San Francisco previews were strong, and while there have been no official reviews yet on Broadway, Laura's already nominated for two theater awards: Drama Desk and the Drama League's Legit awards. And there have been press comments such as London's Daily Mail, which called Laura, "a force of nature." Regardless of what the theater scribes say, you get the feeling from the audience that this show is critic proof to a certain extent and will likely make Laura a marquee name. There was much laughter and even a few tears around me at Friday night's preview as Elle Woods made her journey from bubble-headed blonde punchline to formidable attorney, able to help a fellow bubble-headed blonde beat a murder wrap. And people were humming the tunes around me as we filed out of the theater: "Omigod, omigod you guys." Going into the big weekend, the show has what they call mo' in sports. That said, Laura is clearly exhausted from weeks of non-stop press and things like Friday morning's Today show performance, which was canceled, but still got Laura and the rest of the cast up at 4 a.m. I felt sort of guilty occupying her for a half-hour interview after Friday's show, especially knowing more than two-dozen family and friends were waiting around the corner for a precious few minutes with her. But it seems whenever Kentucky comes calling, Laura makes time, makes it happen, whether it's an ink-stained wretch or high school kids or Lexingtonians who camp out at the stage door. "I've got Big Blue pride," she says. And since those high school years, she has clearly matured, having a life and business savviness now that puts living the dream in perspective. (We will have more on our chat with Laura in tomorrow's Herald-Leader and Kentucky.com.) Living the dream can be a lot of hard work and exhausting, but it's still living the dream. The Delta direct flight from Lexington to New York this morning was essentially the Legally Blonde express, with Laura Bell Bundy's mother, father, step-dad, grandparents, several family friends and her dog all on board the 6:10 a.m. Flight. Mom Lorna Bundy-Jones stood at gate B8 of the Bluegrass Airport terminal clutching the dog, Bella, who is a veteran flyer having crossed the country from New York to San Francisco for the Blonde previews, and then coming home to Kentucky where she stays with grandparents Wayne and Tibby Bell. (In the photo, left, Gretchen King and Lorna put a tres Blonde outfit on Bella while waiting for the shuttle ride into the city.) It looked like they had developed a good relationship, as Bella sat quietly between the Bells on the van ride into The City. Bella looks a lot like Bruiser, Elle Woods' chihuahua in 'blonde,' and Laura's chief rival for ink in the New York papers. Since Bruiser has numerous sleepovers with Laura, having Bella in her apartment isn’t really an option. On the flight, family friend Gretchen King was reminiscing about her first trip to NYC with Laura and Lorna, when Laura appeared on a show about pageants -- she won a few. Like we said in the last post, the Today show appearance was canceled because the Blonde performance was scheduled to be outdoors and, let’s just say the guy selling $5 umbrellas at the corner of Seventh Avenue and 47th Street is doing brisk business today. I hope the weather is better back home. Well, off to walk between the raindrops and explore. Getting off the plane at LaGuardia, it didn't look like a good day for an outdoor performance in New York City, and apparently 'Today' show producers felt the same way. That's why there was no 'Legally Blonde' performance on the show this morning. More later . . . Legally Blonde received 10 Drama Desk Award nominations today, including Lexington-native Laura Bell Bundy who was tapped for Outstanding Actress in a Musical. The Drama Desk Awards cover Broadway and Off-Broadway shows, and are considered a precursor to the Tony Awards. Blonde's nominations include outstanding musical and a double nomination for Jerry Mitchell as outstanding director and outstanding choreographer. Click here to read a full story and list of nominations from Playbill. Laura Bell Bundy got some cheerleading instruction from Robert Eskridge at Town & Village School of Dance in Paris last August. Copyrighted photo by Matt Goins. Yes, there is a delegation of Lexingtonians heading to Gotham this weekend to see the opening of Laura Bell Bundy's Legally Blonde, Copious Notes included. But anyone with a TV can get a sneak preview of the show Friday morning on the Today show. The cast of Blonde will be presenting two numbers, one in the 8:30 segment and one in the 9. According to Playbill News, the first number will be What You Want (the title triggers Joe Jackson's great You Can't Get What You Want, 'Til You Know What You Want in my brain, but I digress), Elle Woods "essay" to Harvard. This is the number that should incorporate some of the cheerleader moves that Laura worked on in Paris last summer. 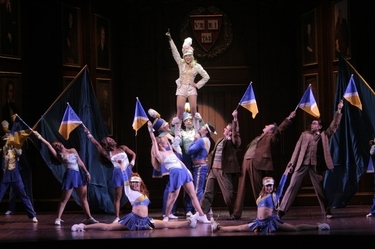 The second song, Bend and Snap, has been one of the most talked about pieces in the show. ~ Blonde and Bundy both received nominations in the Drama League's Legit Awards. ~ Variety also names Laura as one of 10 burgeoning forces on Broadway. ~ Bergen Record columnist Robert Feldberg had a nice take on Laura's career. ~ Blonde proved to be the icing on one Londoner's birthday theater-going trip to New York. Like I said, we will be there this weekend, so the blog will go Blonde and in the print edition of the Herald-Leader, we will have stories Sunday and Monday. Culture notebook . . .
~ The Cannes line-up is out, complete with George Clooney's latest. ~ Monday night was bowling night for Broadway. Laura Bell Bundy played a little 10 pins along with folks like Cynthia Nixon, Alec and Stephen Baldwin and Max Crumm, winner of Grease: You're the One That I Want. Playbill had a nice little photo album from the event, which was a fund raiser for Second Stage Theatre in New York. There's a teriffic little feature on Laura in the New York Post today. The Post also has a story about the handbags Laura designed for Legally Blonde, calling her, "the multitasking Broadway Star." ~ Speaking of Grease: YTOTIW, I got a nice not from Derek Keeling last night. I had dropped the UK grad a note asking if we could catch up with him when we're in New York for the Blonde opening, and he said, "Anything for the people in Lexington." So, hopefully we'll be bringing that story to you, also. 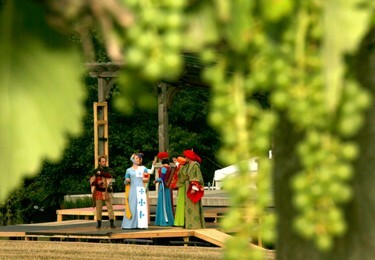 ~ Closer to home, Actors Guild of Lexington is hosting a sort of get-to-know Equus Run event to help familiarize people with Equus Run Vineyards where it is staging Love's Labour's Lost this summer. The event at 2 p.m. Saturday will feature Shakespeare at Equus Run director Anthony Haigh discussing the show, AGL technical director Scott Sherman discussing the amphitheater and how it will be used and Paragon Music Theatre stage director Michael Friedman talking about AGL and Paragon's production of Kiss Me Kate. All that, wine-tasting and spectacular weather. By the way, tomorrow we are going to get back into the swing of things telling you why the director of Anton in Show Business, who hails from the Cincinnati Shakespeare Company, isn't such a visitor after all. ~ Back to Virginia Tech for a moment before I go. My sister sent me the link to a cool slide show from the University of Virginia's website showing campus activities in honor of Virginia Tech. (The copyrighted AP photo of UVa. 's Beta Bridge, left, is by Matthew Rosenberg of Charlottesville's Daily Progress.) Maroon and Orange at UVa. is about as unheard of at Tech as an outbreak of Cardinal Red at UK, but even the strongest athletic and academic rivalries stand down in moments like these. Karen, a Virginia grad herself, titled her e-mail, "We're all Hokies this week," but admitted she'll have to work a bit to find maroon and orange in her wardrobe to wear the prescribed colors of the day nationwide Friday. It was a lot easier for me to recolor this site than it will be for me to come up with that, too. My alma mater, Old Dominion University, also has been showing its support for the Hokies, though we also had to endure a security lockdown, thanks to copycats, apparently. One of the big things that happened over spring break was Legally Blonde began previews on Broadway. Some friends of mine saw it, and were showing me a photo of Laura Bell Bundy and their daughter at the stage door from last Thursday night. Tres cool. A few weeks ago, we raved about Raven Snook's blogging on You're the One That I Want, the Grease reality series. Well, she has a great little write-up on Laura Bell in Time Out New York. Toward the top of the piece, Laura has a some interesting comments about coming home to Kentucky for high school while her understudies in Ruthless, Britney Spears and Natalie Portman, became marquee names. Laura and Blonde director Jerry Mitchell have an entertaining conversation in Next Magazine -- mind you, the language does get a tad risque. Playbill has a nice overview of the show, with comments from Laura. The theater bible also has a cute piece on Chico, the Chihuahua who plays Bruiser. New York Post columnist Michael Riedel identifies Laura as the "pink" horse stalking Grey Gardens star Christine Ebersole for the Tony for best performance by an actress in a musical. The NYC theater critics don't weigh in on Blonde until the official opening, April 29. But that doesn't stop bloggers from weighing in. Do you think Spenc in the City is impressed? We'll keep an eye peeled for more LBB stuff, and we'll be in NYC for opening weekend, so stay tuned.